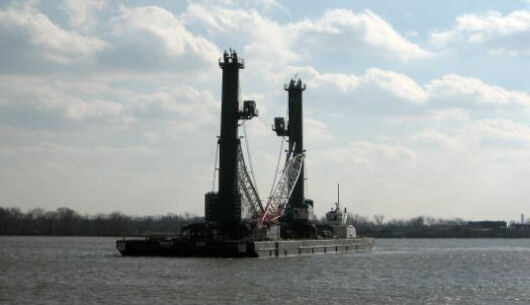 In April 2008, two Liebherr mobile container cranes were relocated from the Penn Terminal in Eddystone, PA, to two different container terminals in Philadelphia, about 15 miles upriver. Since these large cranes, each weighing 430 ST, are not street legal, a cargo barge was used to transport them over the water. Argonautics Marine Engineering, Inc. was hired to provide a suitability review of the cargo barges available in the area, followed by detailed ballast procedures for the roll-on and roll-off operations at the various terminals. Input was provided for the design of the lashing arrangements. The mobile cranes were each rolled onto the 250 x 75 x 16 ft cargo barge WEEKS 246, blocked and secured, and after a short tow, rolled off again at the other two terminals. Provide design loads for the seafastening arrangements.